Earth Vegan is one of our favorite blogs to visit. Her recipes are great and photos are beautiful and inspiring to look at. We recently enjoyed this yummy meal. It’s a great meal especially during the colder seasons. There are many sorts of fava beans. Some are brown, some green, some are dried and some can be gotten frozen. We grow the green sort of fava beans and they can also be bought frozen. We enjoyed this meal with the green olives as well, to match the green fava beans. It was a quick meal to pull together, although cooking it for longer and even enjoying it the next day would probably make it even more flavorful. It’s a very hearty and healthy recipe. I hope you take a look and enjoy it. 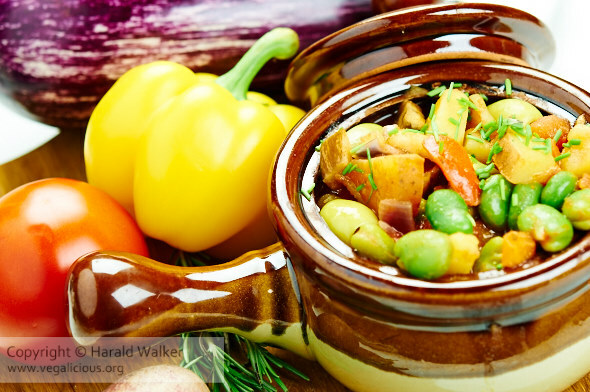 Posted by Chris Walker on November 22, 2010 in Beans, Eggplant, Olives, Reviews.